For fans of Harlan Coben’s Tell No One and Joseph Finder’s Paranoia—a high-octane thriller featuring a tech consultant who unwittingly steps into the rabbit hole of corporate cover-ups—and finds that his highly demanding job has suddenly become highly dangerous. 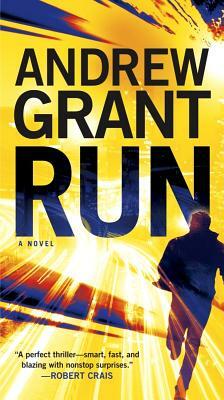 From Andrew Grant, the critically acclaimed author hailed by Nelson DeMille as “a little bit of le Carré and Ian Fleming, but with more grit and a sharper edge,” comes a thrilling novel of suspense that hits the ground running when an innocent man suddenly finds himself a moving target. Suddenly, the only thing standing between him and the wrath of everyone from the FBI to Homeland Security to his desperate ex-bosses is a flash drive full of data that might just be the holy grail of high-tech secrets—and a holy terror in the wrong hands. Now, as the gloves come off and the guns come out, turning back is hopeless and giving up is madness. The only person left for Marc to trust is himself. And the only thing left to do is keep running—or end up a dead man walking.